Using Dina Wakley heavy body acrylics in Eggplant, Ocean, Turquoise and Sedona, I started my page with a different colour combination than I would usually. A bit of stenciling and rubber stamping around the edges of my page began to flesh out where I wanted to go with the colours. Cheddar Scribble stick brought it all together and I finished with some hearts and doodles and finally some sweet words using Tim Holtz Ideaology stickers. Really there isn’t much more to it than that! It’s the end of the year already! Really?!! It snuck up on me! Too fast! Too quick! So much happened this year, so much changed! 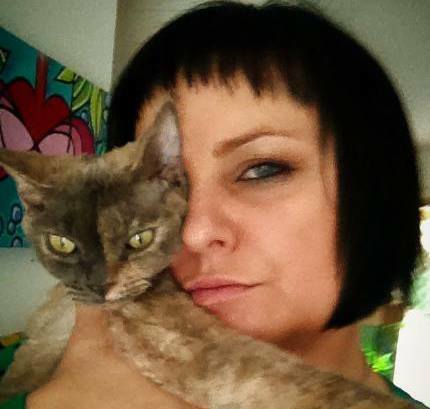 I learnt a lot, I pushed my boundaries a few times and I grew from it 🙂 I acquired lots of new art supplies too :), one new kitten 🙂 and I made new friends. Did I make time to stop and reflect about it? To be thankful for what I have in my life? To cherish all the beautiful people in my life? Not always, not everyday! But I am trying to make it in to a good habit because it keeps me focused, keeps me sane, reminds me to be happy now! Art keeps me sane and happy too, so I thought – why not combine both and create myself a reminder of how amazing life really is 🙂 I have sooooo much to be grateful for every day, month, year! 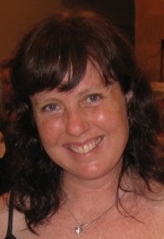 For me my Journal is a perfect place for it as I am spending lots of time flicking through it, playing, writing in it. Maybe it is something you would like to do too ? Neocolour II Crayons – lots!! Hello! 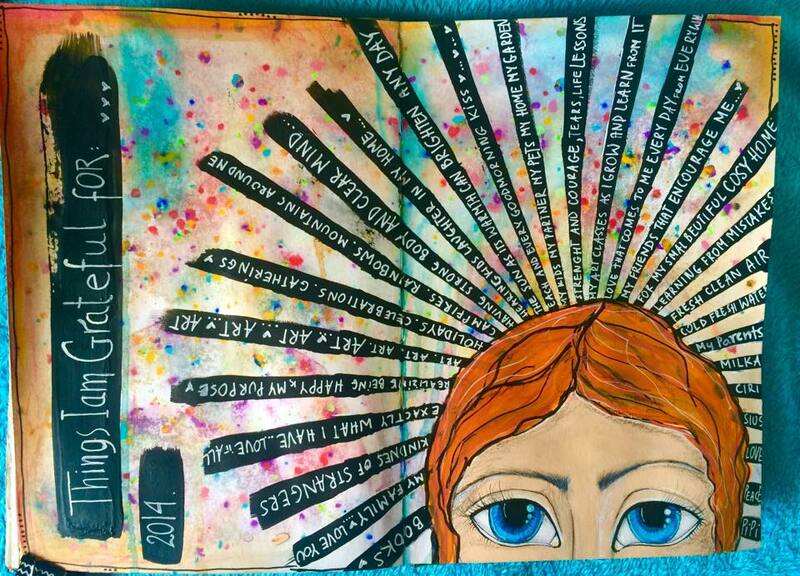 It’s Robyn with you today sharing an art journal page using some brand new Dina Wakley stamps. I tend to love anything insect themed, so when these cute stamps came in they were in my hands so fast! I love the size of the images – perfect for cards, tags or art journaling. 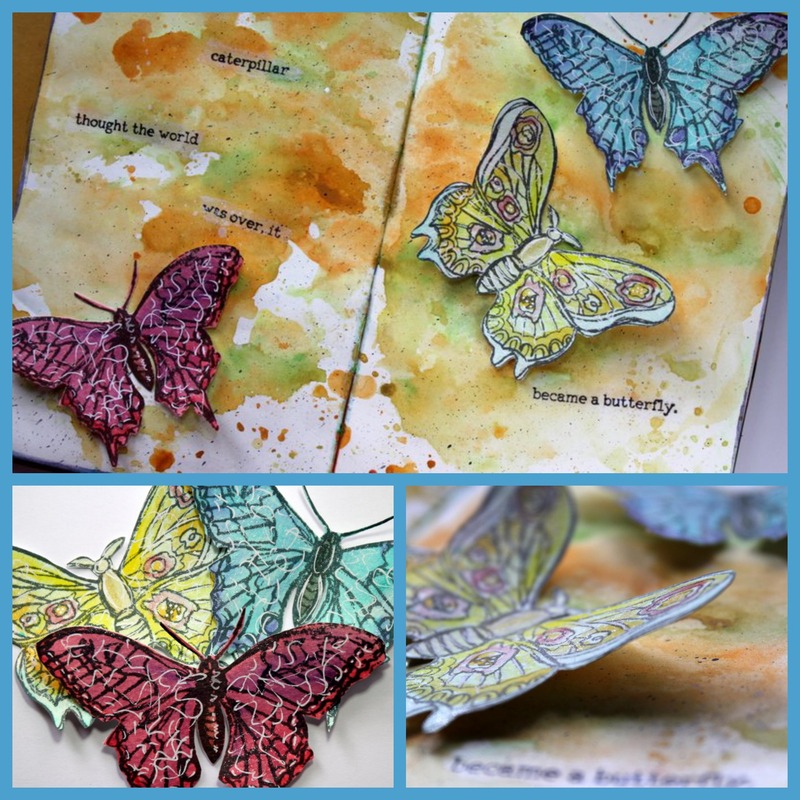 This page comes together quite quickly once the butterflies are stamped, coloured and trimmed – I love how the sparkly butterflies gently pop out of the page. You can easily substitute with different colours or maybe use a different type of background all together! 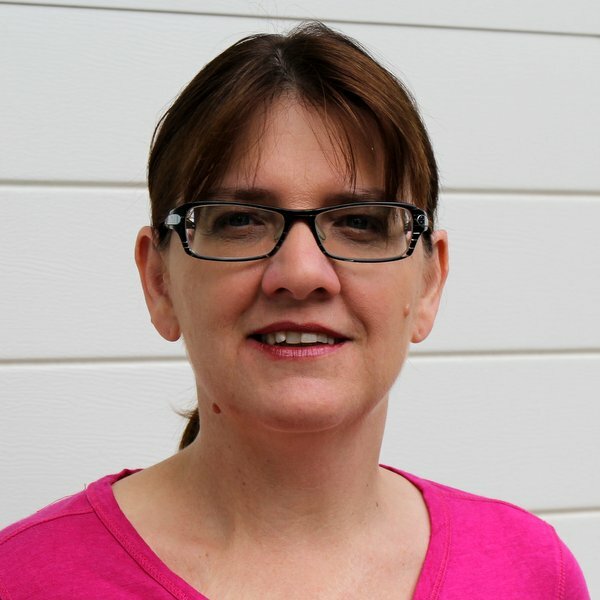 I hope you enjoy learning how to make this page – don’t forget to upload pictures of your projects to our Lulu Art & Friends Facebook page or leave a comment on my blog, www.purplesalt.net. If you use Instagram you can find Lulu Art at http://instagram.com/luluartstore and I’m there as well – http://instagram.com/purplesaltcr8. Pop by and say ‘hi’! 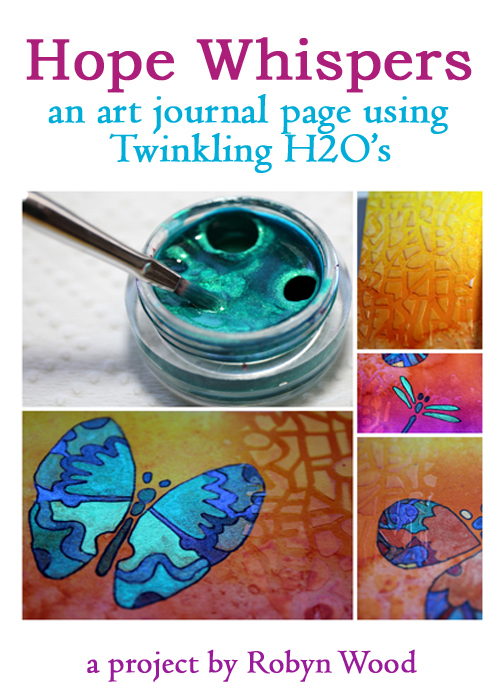 Hello, it’s Robyn with you today sharing an art journal page featuring Twinkling H2O’s. I love these brilliant pots of shimmery watercolour and have had some in my collection since they were first released onto the Australian market – cost me an absolute fortune back then, thank goodness they are accessible and at a reasonable price now! Do you like to use quotes in your art work? As you have probably guessed by now, I frequently feature words, quotes and type of some style in my art. Somehow it just finishes the project and is often the inspiration for direction when I have no idea what to do. 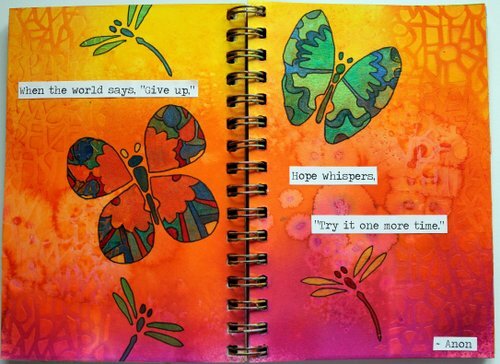 I came across this anonymous quote and felt it matched the hope that butterflies and dragonflies inspire in us all. To create my journaling I printed my quote using the Travelling Typewriter font. You can find it at DaFont. Twinkling H2O’s can be a little tricky to use but once you have the consistency right you will use them on many different projects. To start them off, remove all the caps and spritz each of the jars lightly – then leave them be for 5 – 10 mins to liquefy. Don’t hurry them! It’s ok if just the top of the pot goes liquid. Add a little extra water if needed, you are aiming for a thick, shimmery soup consistency – the kind you might stand your spoon up in. Happy Autumn to you all .. Here in Melbourne we are having the most amazing Autumn. The temperature here is unusually mild and the colour of the leaves on so many trees are glorious! It has inspired me to create the following project. I have used a basic combination of collage, a stencil (Jane Davenport) and Transfer Artist Paper and embellished away with acrylic, pencils and inks…..Happy…..happy…..Autumn days. I hope this finds you enjoying the change of season and your art and that the following video provides lots of juicy inspiration. 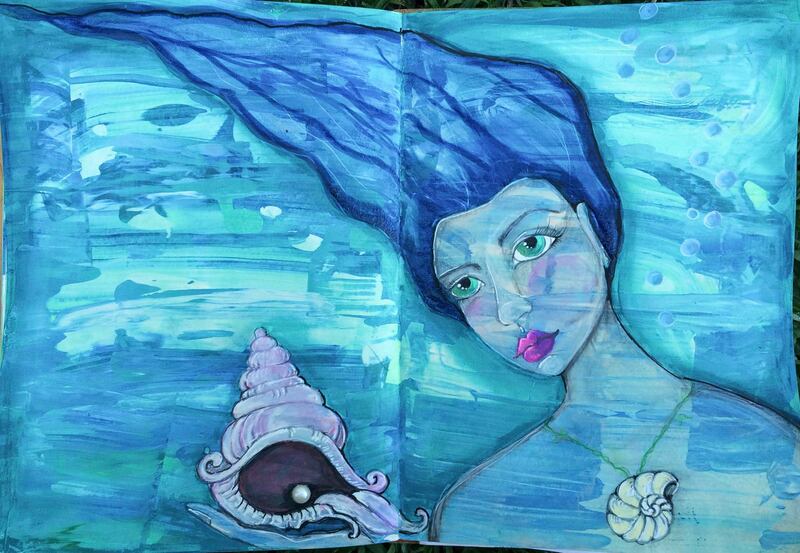 She is like the cloud of shimmering beauty drifting in the depths of the ocean. She is the seeker! She is curious! She is determined! She is fragile looking, translucent and dreamy but strong at the same time! That is how, I think, my story would start… and I am sure she would meet a sweet underwater kitty somewhere along the way. Who knows maybe she can be my friend? Today while I write this, the whole rain thing is making my mind float away to nice places . Or maybe it’s just this yummy blue Celedon Silks acrylic glaze that has me inspired?! Soooo ladies and gentleman! Here she is and she is ” Seeking the true treasures”. Tombow Markers – 703, 772, 158, 755, 528.